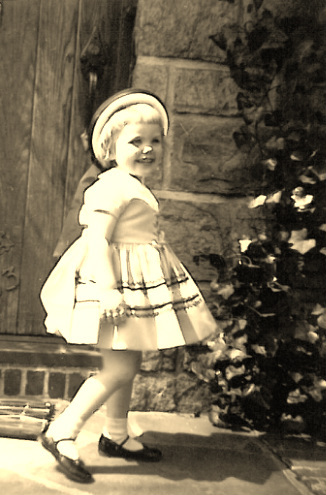 Typical childhood attire of the Mad Men era. I was born in 1957, in Hempstead, on Long Island in New York. Long Island is close to New York City, where my parents came from. The town I grew up in, called Hicksville (not because it's a hick town but after the Quaker abolitionist Elias Hicks), is next to Levittown. The two towns are among the prototypical suburbs developed in the post-World War II housing boom. My two sisters and I were all born within a four-year period (I'm the middle child), and we've been close friends throughout my life. My vocation as a writer was decided early on. One of my teachers told my mother that I had writing ability, and being an aficionado of books and writers, my mother ran with it. When I was eight years old, I saw in our local paper (either Newsday or The Long Island Press) that someone was planning to write a dumbed-down version of one of my favorite books, Winnie the Pooh by A. A. Milne. My mother encouraged me to write a protest letter to the editor of the paper, and not only was my letter published but the op-ed column that day mentioned my letter. Also around this time, a New York City paper (possibly The Daily News) published cute and clever things that kids said in everyday conversation. The column was called "Bright Sayings." On at least two occasions my mother's sisters sent something I had said into "Bright Sayings." Each time my aunts were paid ten dollars and gave me five. My interest in psychology blossomed early too. My grandmother subscribed to all the leading women's magazines of the day---McCall's, Redbook, Family Circle, and Ladies' Home Journal. By age ten or so I had become addicted to the Journal feature "Can This Marriage Be Saved?" in which a real-life husband and wife take turns describing the problems in their relationship and then a counselor analyzes their situation and describes what steps they must take to salvage their union. I enjoyed deciding which spouse had the more legitimate axe to grind and figuring out what advice I would give as their counselor. my early twenties, when I forced myself to overcome it in order to get my own apartment, I've taken my mother's words to heart and experienced many dangerous things that others will never do---such as firing both a machine gun and an assault rifle (under police supervision) and flying in an ultralight aircraft (completely open; basically a stroller with wings!) over an African game preserve.